Today’s bite explores the first likely Kepler detection of something that may have played a role in the formation of life here on Earth – an exocomet! For the last 8 years, Kepler has stared at the stars and exoplanets have waved back, producing an ever increasing directory of stellar brightness as a function of time. With such a huge catalogue of data, big missions like Kepler have algorithms designed to search and highlight features of interest such as the characteristic dip of a transiting exoplanet. Once all of the exciting planetary candidates have been removed, we are left with a collection of oddities that have no clear explanation – these are the signals the authors selected for further investigation. Figure 2: Normalized Flux (brightness) of KIC 3542116, as a function of time, spanning four years of the Kepler mission. The three features of interest initially identified are labelled D992, D1176 and D1268. Further inspection revealed three additional dips labelled D140, D742 and D793. Figure 1 in the paper. 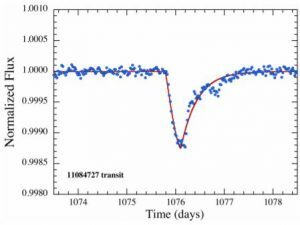 During visual inspection, the light curve of KIC 3542116, a F2-type star, was found to have three asymmetric, transit-like features with easy-to-spot depths of 0.1% over a period of 1 day (see figure 2). Further inspection revealed three dips of a similar shape hidden within the Kepler data that was hidden by stellar variability. The resulting data is shown below in figures 3 and 4. Figure 3: Brightness as a function of time for the first group of three dips discovered – D992, D1176 and D1268. Figure 3 in the paper. The dips are labelled by date with the three shallow dips occurring on day 140, 742 and 793 and the deep dips on day 992, 1176, 1268. Figure 4: Brightness as a function of time for the three shallower dips – D140, D742 and D793. Note that the brightness axis has been scaled by a factor of two here compared to figure 2. Figure 4 in the paper. When comparing the light curves in figures 3 and 4, their shapes are strikingly similar. All transits start with a steep slope of positive curvature, followed by a slower transition back to full brightness with negative curvature. Such similarities led to authors to provisionally label these events as comet transits, caused by comet trails travelling across the disk of the star. KIC 3542116, is that you? To determine whether the dips are astrophysical in nature — opposed to some instrumental defect — and occur in the right location, the team completed several tests. Inspected pixels to determine the location of the transit. The team looked for drop in the brightness of individual pixels to determine if there was a transit. If the difference between calibrated pixels and candidate pixels (as a function of time) is positive, it indicates a transit is happening in that region. Checked there was no video cross-talk between neighbouring cameras. This is when stars being observed using the other three Kepler cameras (there are four CCD cameras for Kepler) are electronically superimposed onto the fourth. Inspected quality flags. If something went wrong whilst the data was being taken, such as cosmic rays hitting the CCD, it is flagged up as bad. Considered Sudden Pixel Sensitivity Dropouts (SPSDs). When a cosmic ray hits a CCD pixel, it can mimic the dip in brightness we’d expect from a transit. It is important to verify that no SPSDs occur in the same location as the proposed transit. This data set passed all tests with flying colours, suggesting it is astrophysical and originating from KIC 3542116. 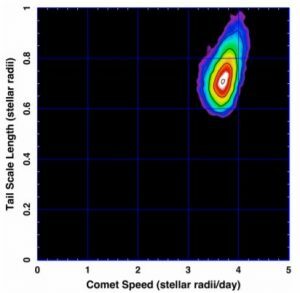 Rolling with the comet transit theme, the authors turned to simple models to determine the velocity of the comets and infer the amount of cometary dust present. To do this, a model of starlight extinction is utilised alongside, what is likely to be, everyone’s favourite tool – a Markov Chain Monte Carlo (MCMC) code. MCMC routines are great for inferring a model fit for a set of data (see this fantastic astrobite here for implementing MCMC code). Figure 5: Likelihood plots of comet speeds and the length of the comet tail. The most likely parameters are in the central region, highlighted by the inner most black contour. Figure 10 in the paper. There are at least two minor bodies around KIC 3542116. With two groups of transits of similar dip depths, the authors believe this indicates there are at least two orbiting bodies capable of producing comet-like transits. Comet speed ~ 35-50 km/s for the larger transits which equates to an orbital period of 10-90 days. The shallower transits correspond to faster speeds of 75-90 km/s and orbital period of 5-50 days. 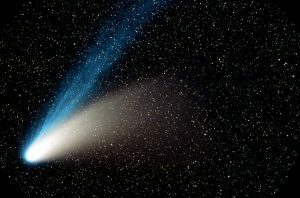 Cometary mass ~ Halley’s comet. A minimum dust content is 1016 g corresponds to a dust mass loss rate of 2.5 x 1010 g every second. By assuming the comet emits dust at this rate for an anticipated number of orbits (MCMC parameters help determine this), the minimum comet mass is 3 x 1017 g – this is a bit greater than the mass of Halley’s comet. 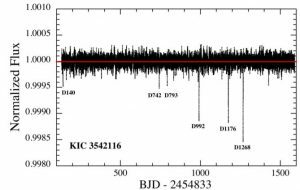 The final bit of compelling evidence for the observed dips in brightness of KIC 3542116 being due to transiting comets is another dip, however this time it observed for a different star called KIC 11084727. Figure 6: Strikingly similar to the dips shown in figures 3 and 4, the team believe this is another example of a transiting comet. Figure 12 in the paper. Comet transits may preferentially happen around stars of this spectral type F. The majority of Kepler’s targets were cooler, Sun-like stars (G and K stars), yet the transit data highlighted has only been uncovered around two more massive F class stars. There may be more hidden comet-like transits in Kepler data. Transit observations in two stars suggest there may be more, probably shallower, dips hidden elsewhere. An automated search in the Kepler data is ongoing. So the answer to the question ‘Is it a comet?’ is probably, meaning Kepler has found its first comet! Currently there are a mere 11 stars around which exocomets have been observed or suspected and this explains why scientists are quite excited about Kepler’s discovery. If we can observe comet-like transits in other stars with the relatively old technology on-board Kepler, then upcoming missions like The Transiting Exoplanet Survey Satellite (TESS) will have no trouble of all. This could be quite a turning point in exocometary science, and will hopefully lead to an exciting era of catalogue expansion.